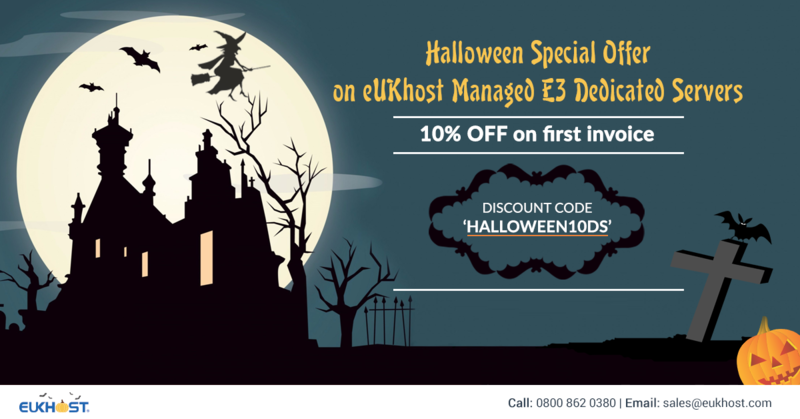 Happy Halloween, get ready to treat yourself with eUKhost Halloween Special Offer on E3 Dedicated Servers. Get 10% off the first invoice on any eUKhost E3 Dedicated Server to continue the celebrations. To take benefit of this Halloween offer use coupon "HALLOWEEN10DS". The Intel® Xeon® E3 Series Advanced eUKhost Dedicated Servers are ultimate web hosting solution for businesses and websites looking for industry leading server configuration. The dedicated servers provided by eUKhost servers are enhanced with optimum performance, uptime and online security with 24x7 Support. To avail 10% OFF use coupon code "HALLOWEEN10DS" valid till 6th November.